On the evening of December 26, 2015, a powerful tornado ripped through the Dallas Metro. In its wake was destruction, injuries and 11 deaths. 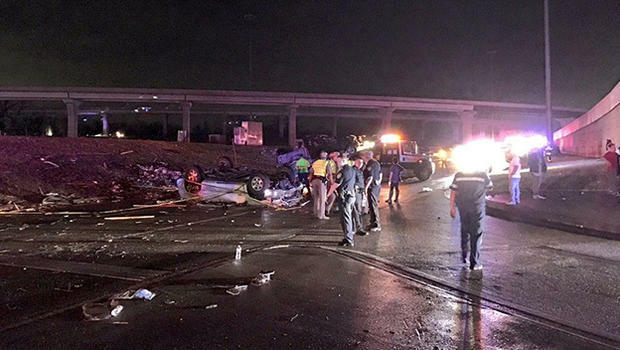 Eight of these fatalities took place at the same spot on Interstate 30 as unsuspecting victims drove straight into the Texas tornado. What can we learn from this unfortunate loss of life? The strongest tornadoes have the fastest wind speeds on the planet Earth. Hurricanes may cover more area, but tornadoes can do more extreme damage. The safest place to be, during a tornado, is in a reinforced safe room or storm shelter. Mobile homes and vehicles are two of the worst places to be. In strong enough winds, vehicles can become flying debris. It is not unusual for damage surveyors to find evidence of cars bouncing before coming to their final landing spot. They have also been found with 2x4s punctured right through them. Needless to say, driving into tornadoes has killed numerous people over the years. No one should be saying these tornadoes struck without warning. The NOAA National Weather Service office in Fort Worth issued the first tornado warning of the day at 1:43 p.m. and continued until 8:44 p.m. that night, 39 tornado warnings in total. Seen in the image below are tornado warnings (red), severe thunderstorm warnings (yellow) and flash flood warnings (green). It was around 6:50 p.m. that the tornado hit the I-30 and President George Bush Turnpike intersection. 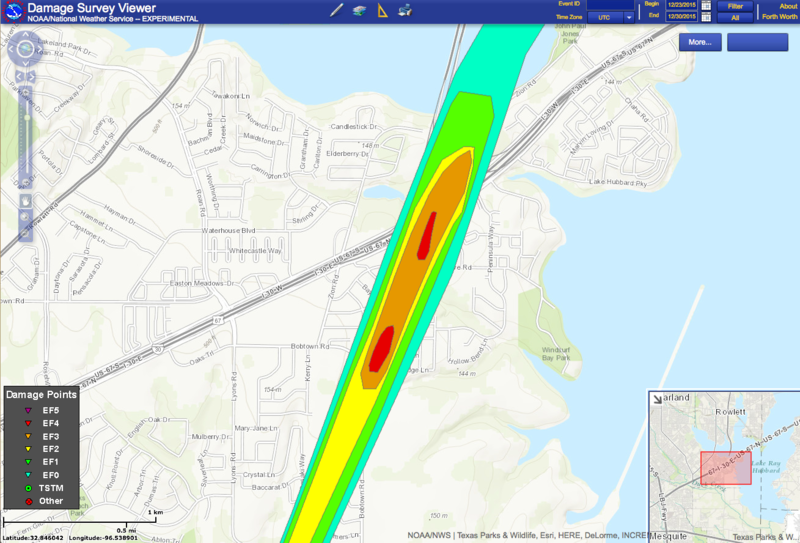 Forecasters were viewing radar imagery that suggested a strong tornado was hitting the area. Reflectivity data showed a hook echo with lofted debris, also seen by the Dual-Pol data. Velocity data showed a rotation couplet with winds exceeding 140 mph. Unfortunately, the sun had set just prior to 5:30 p.m. and it was dark by now. Any vehicles on the road would not be able to see this tornado clearly, unless it was by the flash of lightning. All eight vehicle fatalties occured at this intersection. They were on their way home from visiting family, attending a funeral, celebrating an anniversary, and other everyday tasks that people do. The last thing they expected was to end up driving into a tornado. Their vehicles were thrown from the road, some tossed off the overpass to fall on the road below them. It would have been a terrifying experience. 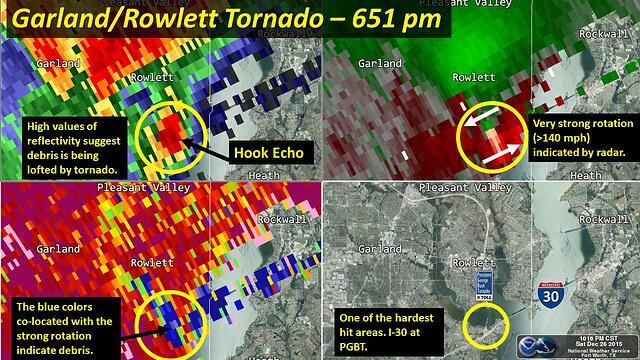 The Garland-Rowlett tornado has been rated as an EF-4 with wind speeds of 180 mph. The path was 13 miles long and about five football fields wide. Some of the most intense damage was very close to the interstate. Staying informed of severe weather can be difficult when you are on the road, unless you have WDT's Weather Radio mobile app. Behind the Weather Radio app is a patented alerting engine that can advise if you are in an area where a weather watch or warning has been issued. In addition, you can save up to five locations, along with your current location, to monitor the weather anywhere that is important to you. Weather Radio is also user friendly to the visually impaired, using Apple’s voiceover technology to ensure as many people can obtain life-saving information as possible. A person with this app, in the tornado warnings associated with the Garland-Rowlett tornado, would have automatically received an alert on their phone. Weather affects us all. Whether it's choosing a light or heavy sweater for the day or making a life-saving decision, the key is to be informed and it's our goal here at WDT to ensure you are. The loss of life that occurred in Texas on Saturday, as well as the southeast during days prior, could have been prevented. While we cannot control the weather, we can tell you when to take action in relation to it.